TBH, I have never really tried a power on recover. I am using the standard Aerobatics Spin manoeuvre which requires a vertical down-line following spin recovery, you don't really want to be adding power at this point.. Most of my aerobats recover in about 1/4 turn, the two KF-40s are a bit slower recovering, I suspect it may be the lack of lateral area on these earlier designs. Both could do with the CG moving forward slightly but I have got them trimmed more or less how I like them now and am just learning to live with this. Ailerons 16mm up, 13mm down; Elevator 12mm up, 11mm down. Happily the cg feels about right and I was most impressed with how the model tracked through looping manouevers. Rolls are okay but I've generally taken the view the an aerobatic model with a symmetrical wing is probably best set up symmetrically so I might try taking the differential out. Anyway, thanks again for taking the trouble to draw this one up and sharing it with us. 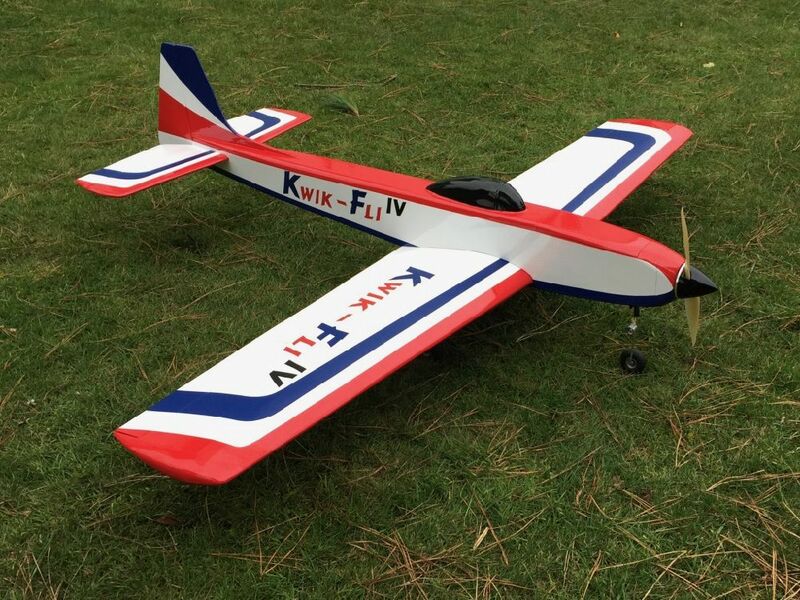 I look forward to getting to know the Kwik-Fli a lot better over the coming flying season. Trevor, the wing profile is symmetrical but the plane is not. The center of drag is slightly under the centre of gravity, so therefore rolls may get more axial with some differential in place. And for some reason I do not understand som F3A planes do best with reverse differential (more down than up). More down elevator than up is normal if you trim for hands of horizontal flight and a sligth pressure on the stick for horizontal inverted flight, as most pilot do. Easy to find out: the diameter of loops with full up and full down should be the same. Really pleased the maiden went well. As Lucas suggests, I think a little differential does help with more axial rolls. Thanks for the kind comments guys, and thanks Lucas for your insight. I managed a couple more flights today. I left the control throws untouched and just concentrated on getting to know and trust the model. It’s beginning to feel more comfortable now, partly because I’m now satisfied that it is not going to do anything nasty when slowed up a bit! The nosewheel retract is still proving temperamental though, so there’s a bit more work to be done there before the project can be called complete. Three more flights today, and I’m really beginning to enjoy it now . Also, the nosewheel retract issue seems to be solved. I’ve never taken one of these cheap electric retracts apart but I have a sneaking suspicion that they don’t have anything as sophisticated as limit switches, perhaps instead relying on detecting the current surge when the motor stalls at the end of the travel? With three units retracting simultaneously, when one reaches the end of its travel, the current surge will inevitably pull down the voltage on the supply rail, and I suspect that these voltage fluctuations as the main gears come up were upsetting the operation of the nosewheel unit which is a tiny bit slower. Anyway, the solution was to put the nosewheel retract on a separate receiver port so that it’s operation could be delayed until the mains have done their thing. The noseleg then has the luxury of a clean power rail (and signal) and as a result seems now to be reliable. All three retracts are operated off a uBEC, while the Rx and flight controls are powered from the BEC built into the ESC so a retract jam is unlikely to affect the control of the model. Anyway, I have now symbolically rolled up and archived the plans, and look forward to many more Kwik-Fli flights in future. I’ll post here again when I’ve uploaded the January diary entry and/or if I get any decent flying shots. "Back in the day", I recall having one of the Phil Ramsey Pitts Specials. A delightful little model, but it did require the full spin recovery technique as per full-size (full down elevator, followed by opposite rudder until the spin stops!). Frightened the life out of me the first time I tried it - even though I did it plenty high enough! The other "interesting" characteristic of that model was that the approach needed to be made with between 30-50% throttle, because as soon as you cut the power, it fell out of the sky like a sack of potatoes! I remember chatting to Brian Lecomber (full-size Pitts expert) about this, and his comment was "Pretty good scale model then! The full-size is just the same!". Trevor, interesting note about the electric retracts, I wonder if the problem would show up if you used a separate physical battery for the retracts, vs the uBEC device you are using. Anyway, neat solution. I guess you must have a fairly fancy TX to achieve this? Otherwise I suppose a retract sequencer would do the same job for those of us with a more basic TX. With my electronics hat on, I would say that using the stalled current draw to terminate the retract drive is a better answer than using a limit switch. Fewer mechanical parts, plus it would prevent a stalled leg from draining a battery. All of which is just like electric windows on your car. Nigel: The Pitts I had was the small one - around 40" span and for a .40 motor (old skool, cross-flow type!). It was very nice to fly once you knew about its idiosyncrasies....! And yes, I thought I was going to need a change of underwear after that first spin!!! Nigel, the stand-alone uBEC has a claimed rating of 5amps, but I’m not truly convinced. The wires from it are really skinny and then of course, with three retract units to power, it is fed through a succession of Y leads and extensions. It’s possible that a battery would cope better with the current spikes but it would be heavier and more hassle. I appreciate that BECs tend to get a mixed press, but all my electric models draw power from their flight pack, from the BEC in the ESC and/or one or more separate BECs. I’ve been flying electric for nearly 30 years now and never had a BEC failure. To be fair, I’ve not had an ESC failure of any kind for at least the last 20 years. Yes, my Tx (Jeti DS16) has a built in sequencer facility so it was easy to delay the operation of the nosewheel - once I had done a receiver swap with another model in order to get a free channnel to connect it to! I take your point about the merits of current surge detection vs. limit switches. Like most technologies (e.g. BECs!) I suppose it’s a case of learning where the vulnerablilities are and working out how to circumvent them to achieve reliable operation. As mentioned in the diary, I will try to update it as an when I get any flying shots and/or video to add. Is there a possibility to get the plans in pdf format for the kwik fli 40? I’m trying to download the plans from the previous post but id dosent work. Yes. No probkems. Can you pm me your email address and I'll send them to you.